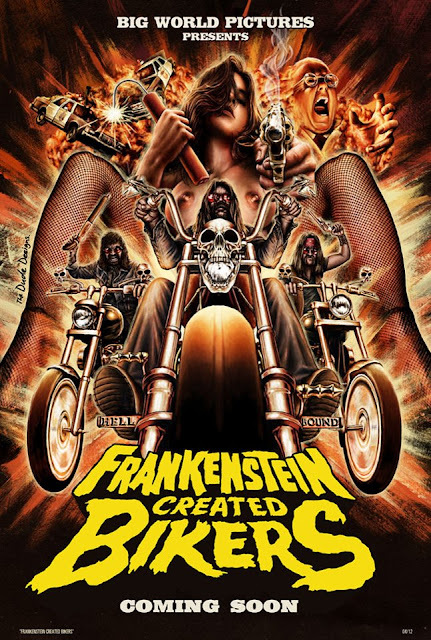 Jill Gevargizian: Frankenstein Created Bikers Teaser! FCB is rumored to have a cameo from Tom "The Dude Designs" Hodge. Tom designed the poster above and the Dear God No! poster. He has designed so many amazing posters in recent years that I wouldn't know where to begin, check out his work HERE. Also, my dearest Laurence Harvey (Human Centipede II), should be making an appearance in Frankenstein. In-case you've been living under a rock and haven't seen the deranged exploitation/drive-in flick Dear God No!, it was released on DVD/Blu-ray/VHS on June 5th. You need to check it out! I first saw the film at Texas Frightmare Weekend convention in May, where I met Bickert and a lot of the cast. They know how to throw a party! Their screening was held Friday night at midnight, where they passed out PBR to everyone as the entered the room. The entire experience was a blast and we have remained friends! I was fortunate to be able to screen Dear God No! at my first ever Slaughter Movie House, June 4th and I hope to screen Frankenstein Created Bikers too. James and I at the Days of Dead Indianapolis convention last month.